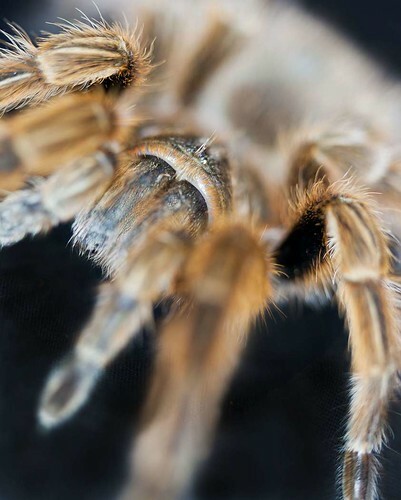 Looking through the front legs of a tarantula at its mandibles. Taken with a macro lens and additional extension tube. Effective focal length 125mm. The quickest way to try out macro is to buy yourself some “Macro Extension Tubes “. They are cheap, effective and very easy to use. The quality of the images are as good as your lenses and you can get started straight away. So what are they? Extension tubes are simply a tube that fixes into your camera lens socket like your lens would. Then, into the outer end of the tube the lens is fitted into the tube. All extension tubes do is literally extend the focal length of your ordinary lens. As it does so it creates a magnification of the image that you would normally see. You can buy extension tubes to fit to most cameras. The simple engineered tube types often have three different sized tubes to change the focal length. You can use one, two or all three of the tubes to extend your lens out from the camera. It depends on how much magnification you want to achieve. You can buy these for around £10 (approx $15). More after the jump. Once you have purchased your tubes you can quickly mount one of your lenses to the camera. However, there are a couple of things to think off. If the lens you use is a short, wide angle lens it may cause your focus to be too close to the end of your lens. This stops you getting a focus. Normally any lens from about 60mm to about 200mm will do. Longer focal lengths give you more working distance in front of your lens. As you can fit tubes to almost any lens, you will need to practice with the lens you are using to adjust the working distance from the lens for the subject you have chosen. Working with simple tubes means that the normal electronics in your lens do not work. This is because the tubes are a basic pipe. It does nothing except join the lens to the camera and lengthen the focal length. It does not carry the electronics that your lens normally uses. Actually this is a blessing in disguise. The focus on macro shots is absolutely critical. Often you only have about 2mm depth of field – tiny! So autofocus, although good, will often pick up things to focus on that are not what you want. Many experienced macro lens users turn off their autofocus anyway when using macro lenses. Then they can work with the more effective manual focus which is more precise at macro magnifications. If you consider it worth the investment you can unbranded electronic focus rings. These do the same as the simple tubes. However, they can be five times the price or much higher for branded ones (Canon or Nikon are several hundred pounds to buy). I have used all three and find ordinary bare tubes to be the most versatile, light and easy to use. When working at very small sizes it is often difficult to light subjects. So it is a great idea to use a tripod. Use this to get the shot lined up and focused. Then you can use a long exposure to make sure you are able to get a bright picture. Tiny changes in focus means that the angle at which you take your shot is important. It is useful to try to get the face of your lens parallel with the part of your subject you want to capture. Otherwise the lens is only going to capture a thin sliver of your subject. It is good to practice with a coin. Try to capture the whole coin surface in focus. Use a tripod to set up the lens so the coin-face and the face of the lens lie perfectly parallel. Then try the shot with the lens at a slight angle to the coin. You will see the focus is sharp where the axis of focus is clear on the coin. But the focus will soften as it falls away from the focus point. Oat biscuit taken with a 100mm Canon Macro lens at 45 degrees. Approx. depth of field is 2mm. 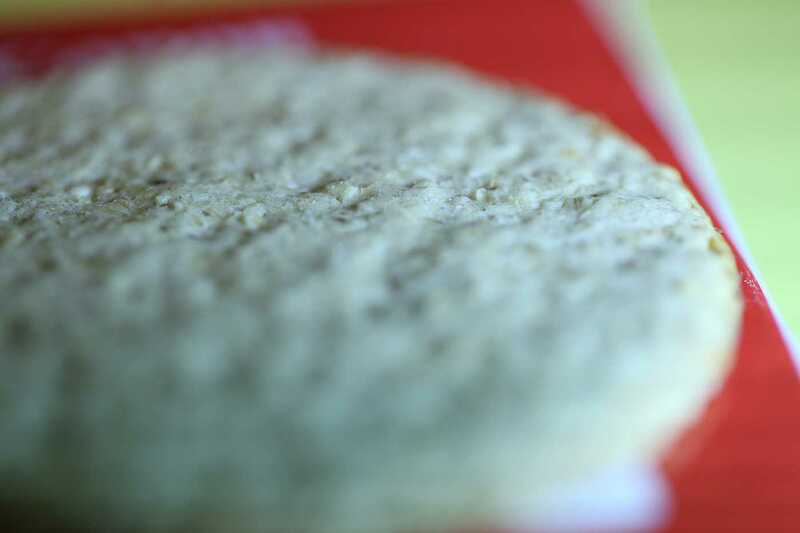 If you line up the face of the biscuit parallel with the face of the lens the whole surface would be in focus. Click to view large. You will need to experiment with different lighting and length of exposure. But practice makes perfect and it is all about having fun. Enjoy! If you like the ‘Dummies’ books, there is one on macro photography which provides a very good round-up of getting started in Macro. If you like to work with explanations and practical examples this book provides an excellent introduction to Macro Photography with lots of useful advice and clear projects for you to work with. I really liked this book. This entry was posted in Background Info., Equipment, Light and Lighting, Shooting specific subjects, Tips Tutorials & Techniques and tagged Buying equipment, How to Shoot, Lens, Macro, Manual focus. Bookmark the permalink.